It is also worth noting that back in April 2018, fake intelligence was used as a justification to bomb Syria. Both President Donald Trump and Prime Minister Theresa May were categorical in their assertions to the effect that “monster” Assad was responsible for killing his own people. On the day prior to the April 13 missile attack on Syria (early morning on the 14th local time), following a telephone conversation between Trump and PM May, it was agreed that the “use of chemical weapons” by president Assad should “not go unchallenged”. This joint White House-Downing Street decision was ratified by PM May’s Cabinet on the morning of Friday May 13. It is now proven that the whole thing was a hoax, a false flag, sustained by political lies and media disinformation: there was not chemical weapons attack in Douma. Lest we forget, more than fifteen years ago (February 2003), fake Intelligence was also used as a justification to invade Iraq in 2003. Colin Powell’s “intelligence report” presented to the UN Security Council in early February 2003 was FABRICATED. It was copied and pasted from the internet by members of Tony Blair’s staff. Powell was referring to “Iraq Its Infrastructure Of Concealment, Deception And Intimidation”, published on January 30, 2003. The Downing Street authors state they drew “upon a number of sources, including intelligence material” (p.1, first sentence). In fact, they copied material from at least three different authors and gave no credit to them. Indeed, they plagiarized, directly cutting and pasting or near quoting. A close textual analysis suggests that the UK authors had little access to first-hand intelligence sources and instead based their work on academic papers, which they selectively distorted. Some of the papers used were considerably out of date. This leads the reader to wonder about the reliability and veracity of the Downing Street document. It was a fake document prepared on the instructions of prime minister Blair with a view to building a “credible” justification to wage war on Iraq. 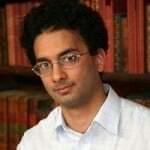 Rangwala’s analysis was more than a smoking gun. It revealed the Big Lie. It invalidated Colin’s Powell’s presentation to the UN Security Council. It had to be suppressed. The “WMD facts” had to be “documented”. Did British intelligence refuse to comply with Tony Blair’s demands to produce a fast track report which would “fix the facts”? Rangwala’s analysis confirms that British intelligence was not involved in what we might describe as the “Sloppy Dossier”. The “facts” were put together in a hurry (not by MI6) but by Tony Blair’s public relations’ staff, who casually committed acts of plagiarism and political fraud in support of a criminal military agenda. The report was finalized one week before Colin Powell’s presentation to the UN Security Council; the “facts” and supporting quotations were copied and pasted by members of Tony Blair’s cabinet from the internet and inserted into an official and authoritative document. Plagiarism had become a means to justifying the war on Iraq. The Rangwala revelation was the “unspoken truth”. With the exception of Channel 4 and The Guardian, it was not the object of mainstream media coverage both before as well as after the March invasion of Iraq. It had to be suppressed. The invasion of Iraq had already been scheduled for March 2003. 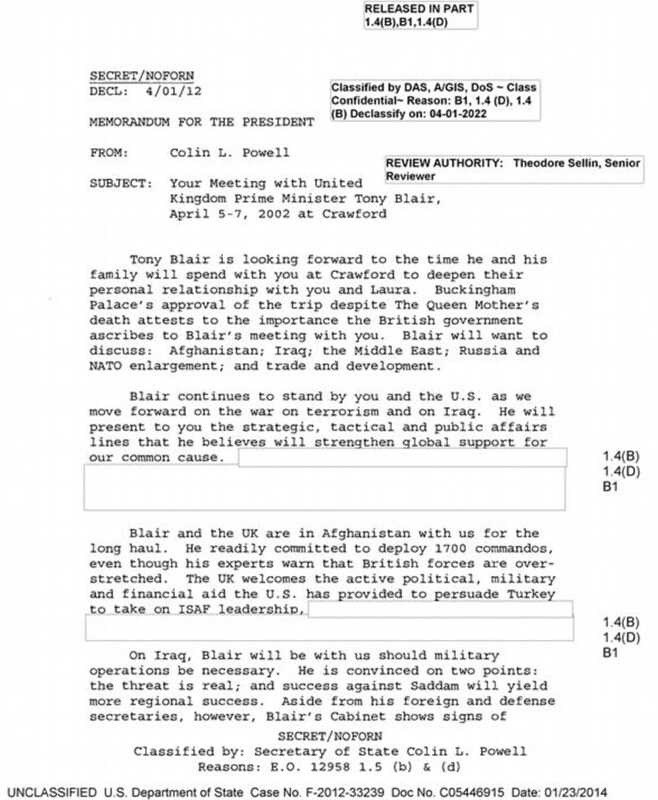 In retrospect, the Rangwala findings also bring to the forefront the insidious and complicit role of Colin Powell, who organized the Crawford Texas meetings in early April 2002 between Bush and Blair, as confirmed by the recently leaked emails (see below). What these emails suggest is that Colin Powell had been entrusted in setting the stage for the war on Iraq, initially at the Bush-Blair Crawford meetings on April 5-7, 2002, leading up to his presentation of the British intelligence dossier on Iraq’s alleged WMD at the UN Security Council on February 5, 2003. Lest we forget Colin Powell played a behind the scenes role in the Iran Contra Affair. The Crawford meetings were intended to plan the war on Iraq. Colin Powell was a central political instrument. The issue is who was Behind Colin Powell? Who was present at the Crawford meetings? Reports confirm that Colin Powell, Donald Rumsfeld, Paul Wolfowitz, Condoleeza Rice were among those present. In the wake of the Iraq invasion, the plagiarized “British intelligence Iraq Dossier” presented to the UN Security Council by (former) Secretary of State Colin Powell was so to speak “forgotten”. The plagiarism issue nonetheless confirms beyond doubt the war crimes’ allegations against George W. Bush and Tony Blair. Rangwala’s report was known to Britain’s parliament. 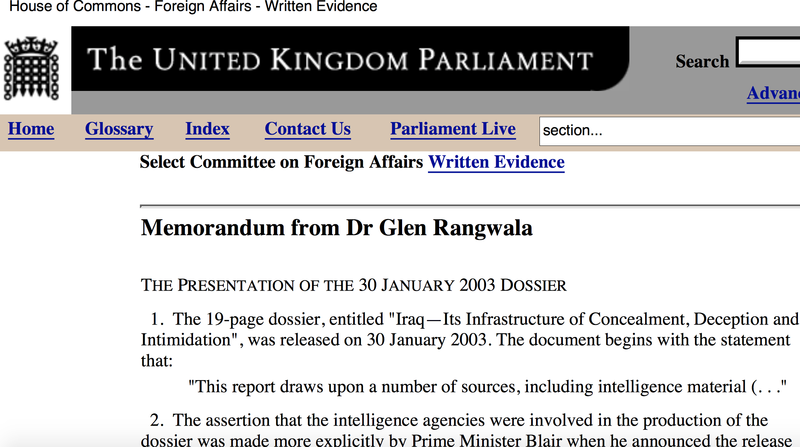 It was presented three months after the war was launched: In June 2003, Rangwala submitted his findings to the House of Commons Select Committee on Foreign Affairs. (see below for full text). There was no follow-up. Rangwala’s report confirmed the criminal nature of the US led war on Iraq, which resulted in more than 2 million civilian deaths. 3. The bulk of the 19-page document (pp 6-16) is directly copied without acknowledgement from three different sources that are on the internet. The most extensively used source is an article in the on-line Israeli journal, Middle East Review of International Affairs (September 2002), entitled “Iraq’s Security and Intelligence Network: A Guide and Analysis”. 4. The author of the piece is Mr Ibrahim al-Marashi, a postgraduate student then based at the Monterey Institute of International Studies, California, who is completing a doctorate at Oxford University. He has confirmed to me that his permission was not sought; in fact, he didn’t even know about the British document until I contacted him on 4 February to enquire whether his permission was given. 7. Because the texts of these three authors are copied directly also results in a proliferation of different transliterations (for example, different spellings of the Ba’th party, depending on which author is being copied). “monitoring foreign embassies in Iraq”. “spying on foreign embassies in Iraq”. “supporting terrorist organisations in hostile regimes”. 11. The reference in Mr Boyne’s article to how the organisation was made up of “bullies and country bumpkins” was shorn of its last three words in the UK dossier, perhaps to render a more threatening picture of the organisation than that contained in the original article. 12. Numbers are also increased or are rounded up. So, for example, the section on “Fedayeen Saddam” (pp 15-16) is directly copied from Boyne’s article, almost word for word. The only substantive difference is that Mr Boyne estimates the personnel of the organisation to be 18,000-40,000 (Ken Gause, in another article that was substantially copied, estimates personnel in the region of 10,000-40,000). The British dossier instead writes “30,000 to 40,000”. A similar bumping up of figures occurs with the description of the Directorate of Military Intelligence. 13. There is at least one serious substantive mistake in the British text, on p 14, about the Iraqi organisation the Military Security Service (al-Amn al-Askari). After an initial two paragraphs copied from Marashi’s 2002 article, the remainder of the text is taken from the description by Sean Boyne in his 1997 article of a wholly different organisation called the General Security Service (al-Amn al-Amm). That is, it mixes up the descriptions of two different organisations. 15. Later in the same section, the UK dossier claims that the head of the Military Security Service is Taha al-Ahbabi. This is from Boyne’s description of the General Security Service. In fact, the Military Security Service was headed by Thabet Khalil when the dossier was released. 16. The information in the UK dossier is presented as being an accurate statement of the current state of Iraq’s security organisations. However, it may not be anything of the sort. Mr Marashi—the real and unwitting author of much of the document—refers in his article to his primary source as being the documents captured by Coalition forces in 1991, and which are now retained by the Massachusetts-based organisation, the Iraq Research and Documentation Project. His own focus is the activities of Iraq’s intelligence agencies in Kuwait in the period from August 1990 to January 1991, as this is the subject of his thesis. As a result, much of the information presented as relevant to how Iraqi agencies are currently engaged with UNMOVIC is 12 years old.